On Netflix, I've recently been watching a late-1990's spy-action TV show by Joel Surnow called La Femme Nikita. Loosely based on the Luc Besson film by the same title, the show features the usual mix of elements we expect from the genre: a ridiculously good-looking cast, dangerous situations, plenty of action, and (what was then) high technology. A couple of factors separate the show from the rest of its ilk. One is the bold, surreal visual aesthetic, imparting the sense that the entire series takes place in a music video and that the cast is always ready to bust out into choreographed dance moves. The other is that every single episode seems to center around not just an enemy to overcome but also an ethical dilemma to agonize over. Nikita's government employer is all-too-willing to kill innocents to keep its secrets, and Nikita struggles, often unsuccessfully, to reduce the body count. Ethical unease is the crux of the show. As we've seen in the charts of Jennifer Lawrence (Katniss Everdeen), Leonard Nimoy (Spock), Clint Eastwood (Dirty Harry, etc.) and Jonathan Rhys Meyers (Henry VIII, Dracula), the charts of actors tend to contain the seeds of their most memorable character portrayals. 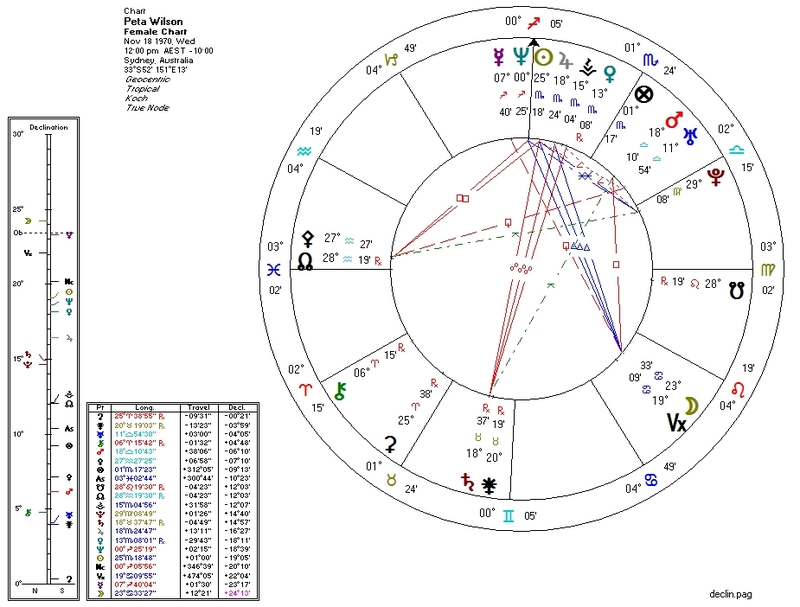 So we might expect to see a conflicted but strong Pallas in the chart of "Nikita" star Peta Wilson, reflecting the ethical battles her character must constantly fight both within and without. That's exactly what we see here in the chart. Pallas quincunx Pluto and widely square Jupiter, ruled by Saturn which is opposite Jupiter: these are extremely strong anti-Pallas aspects and indicate the potential for evil. But Pallas is tightly conjunct the North Node (the one factor which, with Pallas, can overcome all opposition). This is indicative, as in the charts of whistle-blowers, of a struggle between the aggressive and the defensive uses of power. One in which the deck is stacked towards the defensive and towards non-aggression. Of course, Wilson, whose looks scream "fashion model", also has Pallas "squine" Venus (which is ruled by Pluto, also in aspect to Pallas). In my research, this type of configuration is consistent with extreme sexual magnetism. The 2010 reboot series Nikita starring Maggie Q appears to be a more typical feel-good action-oriented spy series with clear-cut heroes and villains, like Alias. Where Peta Wilson's Nikita wrestled (often without resolution) between conscience and survival, Maggie Q's Nikita is downright cocky about her ethical decisions, and the writers seem to expect the audience to agree with her. This later series appears to be based not so much on the original movie(s) but on the Surnow/Wilson TV show, minus much of the ethical angst. It boasts moments of startling cleverness and exciting fight choreography but in my view does not match the subtlety and sophistication of the earlier show.